My brand new iPhone 5s developed sound issues right on the first day, just hours after I purchased the smartphone from Best Buy. When I tried playing music in iTunes, a YouTube video or a Live TV app no sound would come out of the two speakers at the bottom of the iPhone 5s. Frustrated over the absence of the sound from a spanking new iPhone 5s, I did the only thing I could think of. I switched off the iPhone 5s by pressing the button on the top right of the device. When I turned it back on, the speakers worked fine and I could now listen to music and play any app that had sound. But the same problem occurred again the next day and I had to repeat the process of switching off and on the iPhone 5s. By the way, I was already running iOS 7.0.2, the latest version of the underlying iPhone 5s software. Not pleased with the silence from my iPhone 5s, I called Apple (1-800-MYAPPLE) tech support. New iPhone customers are eligible for 90-days of free technical support. So don’t hesitate to take full advantage of the support during the 90-day period. It is your right and Apple’s obligation to satisfy you and help you with any problems with a new iPhone. The Apple tech support representative I spoke with assured me that the absence of sound from the speakers in my iPhone 5s was not a hardware issue but related to the new iOS 7 software. Apparently, I was not the only iPhone 5s customer to encounter the missing sound problem. “Because of the many changes in iOS 7, the settings from the previous version of iOS don’t quite line up in iOS 7,” the Apple tech support rep said. He asked me to tap the Settings icon on the home screen of my iPhone 5s, then select General and scroll down to the bottom and pick Reset. 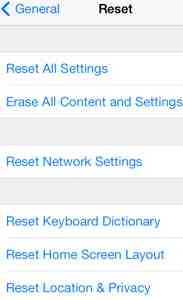 Once you are in the Reset window, click on the Reset All Settings. The good thing about Reset All Settings process is that it fixed the sound problem on my iPhone 5s but the bad thing is that it deleted all my custom settings like WiFi password, fingerprint authenticator on TouchID, ringtone and alerts. So I had to set up my WiFi again and scan my fingerprint one more time. Mercifully, the Reset All Settings process does not remove any of the content, music or contacts on the iPhone 5s. At least, it did not when I was fixing the sound problems in my iPhone 5s. An Apple tech support rep told me that you have to go through the Reset All Settings process only once to fix the missing sound from the built-in speakers in iPhone 5s. In parting, I must say it’s distressing that Apple should release costly smartphones like the iPhone 5s without fully putting them through a rigorous testing process and ironing out all the wrinkles and bugs.